Through our comprehensive childcare services, Growing Places provides early childcare, education and recreation daily to 150 children at three locations. Our two early childhood locations are in Durham, NH and Lee, NH while our school-age program operates at Moharimet Elementary School in Madbury, NH. 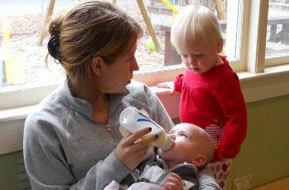 Our programs are designed for infants through school-age children and accommodate part-time or full-time schedules.